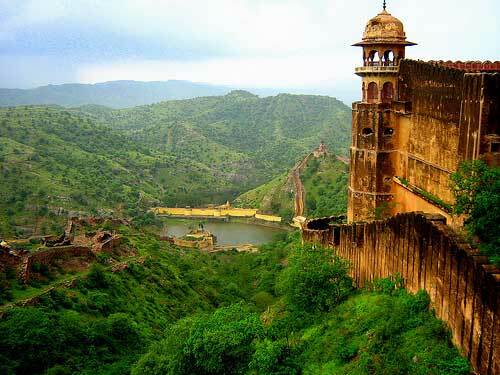 Jaigarh Fort, Jaipur: Jaigarh Fort is situated on the promontory called the Cheel ka Teela of the Aravalli range near Amber in Jaipur, Rajasthan. The fort was built by Jai Singh II in 1726 to protect the Amber Fort and its palace complex and was named after him. The fort features a cannon named “Jaivana”, which was manufactured in the fort precincts and was then the world's largest cannon on wheels. Jaigarh Fort Treasure, Emergency and Indira Gandhi: When Emergency was imposed in 1975-76, the govt ordered a raid of all royal palaces here as a result of which this fort like many others in the state, was searched by army men. Since then this fort has been the subject of much debate. Wikipedia quotes The search had been ordered during the Emergency declared by the Indian Prime Minister Indira Gandhi during 1975–1977. A futile search was also launched, in 1977, of all the buildings in the fort, by the Income Tax department, using metal detectors. However, the search carried out for treasures by an Army unit at Jaigarh Fort, after a three-month search had found no treasures. * Built by Jai Singh II in 1726. * Jaigarh Fort has “Jaivana” cannon, world's largest cannon on wheels.